Nicholas Sotheby Pitcher was formerly a director of Christie's and ran the Oriental Department at Christie's South Kensington from 1976 to 1990, when he left to set up his own Chinese porcelain antiques and Chinese pottery business. Since then he has operated from a discrete 1st floor premises just four doors from Sotheby's in the heart of London's Mayfair, specialising in early Chinese porcelain antiques, chinese pottery and bronzes plus later Chinese works of art of all kinds, from antique Chinese ceramics to paintings. He regularly exhibits at New York's Arts of Pacific Asia Show and participates in Asian Art in London each year. On the website are images and details of a variety of Asian and Chinese porcelain antiques currently in stock. 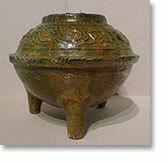 Our chinese ceramics page features an up to date catalogue of antique Chinese porcelain and art. 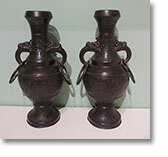 The oriental ceramics featured are from all periods, from BC to 18th Century. For more information on the Chinese porcelain antiques on this site including all Chinese ceramics, Chinese pottery, Chinese bronzes and Oriental bronze antiques please browse through the site and feel free to contact us.